What Fees Does the VA Charge? Just How Good Does My Credit Have to Be? What Are the VA No Money Down Loan Limits for Hampton Roads, VA? What Types of VA Loans Are There? What is the Maximum VA Loan Amount for Which I Qualify? What Documentation Do I Need to Apply for a VA Loan? What Happens After I Have Chosen a Lender? What Settlement Expenses am I Allowed or not Allowed to Pay? What Concessions Can I Negotiate from the Seller? The Veteran's Administration (VA) doesn't lend money. VA guaranteed loans are made by private lenders, such as banks, savings & loans, or mortgage companies to eligible veterans for the purchase of a home which must be for their own personal occupancy. The VA guaranty means the lender is protected against loss if you fail to repay the loan. The guaranty replaces the protection the lender normally receives by requiring a down payment thus allowing you to obtain favorable financing terms. You are eligible for VA loan benefits if you serve on active duty in or were honorably discharged from the United States Navy, Army, Air Force, Marine Corps, or Coast Guard and have good credit. The US Department of Veterans Affairs website provides detailed information on how to obtain a VA Loan. When obtaining a VA Loan, the Department of Veterans Affairs requires payment of a funding fee, which varies from 0 to 3.3% of the loan amount. The fee varies depending on the number of times you have obtained a VA loan. The fee is reduced if you choose to put money down. The borrower has the option to finance the funding fee into the loan amount. The funding fee helps offset the cost to administer the VA Loan program. Reference the charts below to determine your VA funding fee for a new home purchase. Different fees apply for cash out refinancing, interest rate reduction refinancing, manufactured home loans and VA loan assumptions. A borrower's past credit performance is analyzed when determining loan approval. A borrower who has made timely debt payments for the last 12 months shows their willingness to repay future credit obligations. Based upon many factors credit bureaus compute a credit score to indicate your credit risk. The FICO score is the one most commonly used by mortgage lenders. The VA does not establish a minimum FICO score required to obtain a VA Loan. This is left up to the loan underwriter. FICO credit scores range between 300 and 850. Generally, the higher the score, the less risk the person represents. When the underwriter analyzes the borrower's credit; it is the overall pattern of credit behavior that must be reviewed, rather than isolated cases of late payments or some other derogatory information on your credit report. A period of financial difficulty does not disqualify the borrower if a good payment pattern has been maintained since then. The lack of an established credit history should not be a deterrent to loan approval. A satisfactory payment history on items such as rent, utilities, phone bills, etc., may be used to establish a satisfactory credit history. Most military families know months before they relocate that they plan to buy a home at their new duty station. This is the perfect time to review your credit report for errors and/or where improvements can be made. This can have a significant impact on the amount of loan for which you can qualify. The Fair Credit Reporting Act allows consumers to obtain one free credit report from each of the three major reporting bureaus every 12 months. To obtain your report visit: AnnualCreditReport.com – the only authorized source for consumers to access their annual credit report online for free. You may also call the Annual Credit Report Service at 877-322-8228. A minimum of two years must elapse since the discharge date of the borrower and/or spouse's Chapter 7 bankruptcy, not the filing date. A full explanation of the bankruptcy will be required. The borrower must also have re-established good credit, qualify financially and have good job stability. A borrower still paying on a Chapter 13 Bankruptcy can obtain a VA Loan if payments to the court have been satisfactorily made and verified for a period of one year. In addition, the court trustee will need to give written approval to proceed. A full explanation of the bankruptcy will be required. The borrower must also have re-established good credit, qualify financially and have good job stability. If a collection is minor in nature, it usually does not need to be paid off as a condition for loan approval. Judgments must be paid in full prior to closing. A borrower is not eligible for the loan if they are delinquent on any federal debt. This can include tax liens, student loans, etc. Payment arrangements that would bring the borrower up to date may be considered for loan approval. If a veteran, or veteran and spouse, have prior adverse credit and are participating in a Consumer Credit Counseling Plan, they may be determined to be a satisfactory credit risk if they demonstrate 12 months' satisfactory payments and the counseling agency approves the new credit. What Are the VA No Money Down Loan Limits? 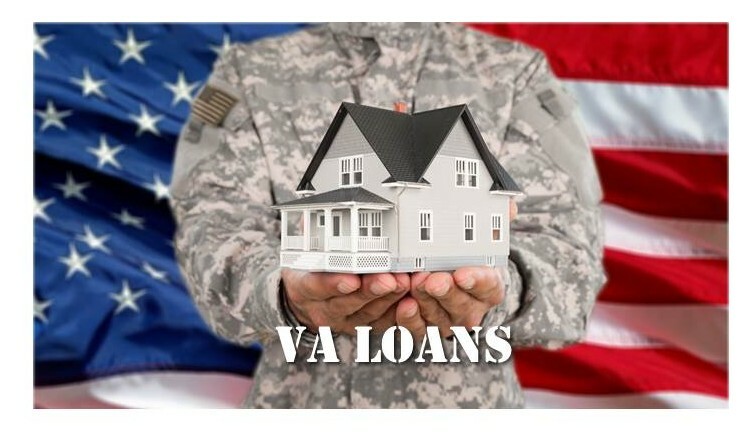 To find the VA full entitlement no money down loan limits in your area – Click Here! If a veteran has previously used entitlement that has not been restored, the maximum guaranty amount available to that veteran must be reduced accordingly. If the veteran is putting money down the VA Loan limits increase accordingly. Talk to your lender to determine your personal loan limit given your unique situation. The VA guarantees 30 year fixed rate mortgages and a VA Hybrid Adjustable Rate Mortgage (ARM) product. VA adjustable rate mortgages offer an initial fixed interest rate for a period of three or five years after which the interest rate adjusts annually. The 3/1 and 5/1 VA Hybrid ARM products allow a 1% annual interest rate adjustment after the initial fixed interest rate period, and a 5% interest rate cap over the life of the loan. The interest rate is based upon the U.S. Treasury Securities market index known as 1-year constant-maturity Treasury (CMT) securities index. This index plus either a 2% or 2.25% margin equals the interest charged by the lender at the 3 or 5 year mark when the rate starts adjusting. Initial interest rates are generally more favorable for adjustable rate mortgages than for fixed rate mortgages. Because you qualify at the initial note rate, you can normally qualify for a larger loan amount with an adjustable rate mortgage. Active duty members of the U.S. Armed Forces being stationed for no more than 3-5 years at their new duty station may want to consider one of the adjustable rate mortgage options. More information about adjustable rate mortgages may be found at the Consumer Financial Bureau (CBFP) website. When you pre-qualify for a VA Loan you can count your income plus, if you are on active duty, your Basic Allowance for Housing (BAH). In addition, if you are married, your spouse's income counts if their name is on the loan application. According to VA guidelines, borrowers must qualify according to a set debt to income ratio which is used to determine whether they can reasonably be expected to meet the expenses involved with home ownership. The maximum debt to income ratio allowed by the VA is 41%. In other word no more than 41% of your combined gross monthly income can be spent for housing and other debts to qualify for a VA Loan. This is commonly referred to as a back ratio. Like with most rules there may be some flexibility to slightly exceed this set limit on a case by case basis. In addition, the Department of Veterans Affairs will not back a loan if military borrowers don't meet or exceed a minimum residual income threshold which varies by individual family size, and by the cost of living by geography. Residual income is the monthly household income which remains after a homeowner has made monthly payments to on all of his credit accounts. This includes the mortgage and escrows, of course, as well as whatever student loans, car payments, credit card bills and whatever other obligations exist. As an example of how residual income works, a family of two in Florida applying for a VA loan must have at least $738 in residual income monthly. By contrast, a family of five in California applying for a VA loan must show $1,158 in residual income monthly. By enforcing residual income requirements, the VA increases the chances of its borrowers earning sufficient income to meet all financial obligations, and to have a cushion in the event of a crisis. Caution: It's great to know the maximum amount of money you can borrow but you may or may not be comfortable with the associated payment. It's better to stay within your comfort zone when purchasing your new home. First you’ll need a Certificate of Eligibility (COE) which you can apply for online, thru the mail or via your lender. Click Here for instructions on how to apply for your COE. You will also need to include a "Statement of Service" or a “DD Form 214” with your request form. The DD-214 is issued upon retirement from the military. If you are on active duty you can get a "Statement of Service" from your personnel office. It must be written on command letterhead stating you have been on active duty since the date you entered active duty until the present date. Once submitted, you should receive your certificate in about 2 weeks. Lenders can obtain, in most cases, electronic VA approval when you apply for a loan! This will allow you to shop for a home with confidence while you wait for your VA COE to arrive. Social Security numbers for both you and any co-borrowers. The law requires a veteran obtaining a VA guaranteed loan to certify that he or she intends to personally occupy the property as his or her primary residence. Veteran or non-veteran spouses do not have to jointly apply for a VA loan but they can be placed on the deed to the property with the veteran’s permission and hold the property as Tenants by the Entirety. Non-married persons cannot purchase a home together unless they both are veterans. There is more to choosing a lender than comparing rates. Talk to your REALTOR®, family and friends about lenders they would recommend. Interview at least two but preferably three lenders to compare services offered. You may wish to include a credit union or bank with which you belong or do business. Large national mortgage companies are often very competitive. There are advantages to choosing a local lender who is familiar with the Hampton Roads market and who does not have to outside the area for underwriting approval. Don't worry too much about multiple credit inquiries adversely affecting your credit score. Score models allow multiple inquiries within a 30 day period before it re-scores you. The score model looks for inquiries within that 30 day period and only counts it as one inquiry. When inquiring about rates, be sure to ask if the quoted interest rate reflects payment of points. Many loan programs allow you to receive a discounted interest rate by paying a fee in points or origination fees. One point equals 1% of the loan amount, and the more points you can or wish to pay, the more you can lower your rate. Paying points is not a requirement; it's just an option that lenders offer to accommodate the immediate or long-term monthly payment concerns of home mortgage customers. Most lenders typically quote rates with one total point (zero discount points and one origination point). Don't be fooled by the teaser rates most websites publish. It is very difficult for any lender to provide a loan based on those rates, they are meant to get you to apply. Rates not only depend on market conditions, but also your credit score, loan amount and type of loan. Because rates can fluctuate throughout the day, it is almost impossible to compare rates with multiple lenders. You would need to match the same loan, closing cost, and rate (at the same time of day) to correctly compare rates. When you're shopping for a home mortgage, make sure you ask lenders for the Annual Percentage Rate (APR) as well as the interest rate, so you compare one rate accurately to other mortgage rates. In addition to the interest rate (which determines the amount of your monthly payment), the APR figures in the other costs required to make the loan to determine your loan's total finance charge, (the lender's rate of return earned by lending you money) expressed as a percentage over the scheduled life of your loan. The APR reflects the true cost of a mortgage loan over its full scheduled term as a yearly rate. In addition to the rate of interest charged on the loan, the APR includes certain other prepaid finance charges. These charges may include, but are not limited to, origination fees, loan discount points, VA funding fees and prorated interest paid from the closing date to month's end. Talk to your lender about their interest rate lock policies. A lock gives you a specified period of time usually from 30 to 120 days of protection from financial market fluctuations in interest rates by setting the range of pricing available to you. The shorter the lock period is, the more favorable the interest rate will be. Your rate may still be affected by changes in your credit profile or in the loan's characteristics (for example, if you choose to pay more or fewer points). If you choose to float your pricing, then your rate will fluctuate with the market. The benefit to floating is that you would have the option of locking at a lower level if rates decrease. The risk, of course, is that you would face a higher interest rate should interest rates rise before you lock. Generally, you'll be able to lock once you have found a property, and as late as five days before closing. Some lenders also offer programs that allow you to lock pricing before you find a property. When you do lock, make sure the lock period allows enough time for your loan to be processed. If your lock period expires before you're ready to take ownership of the house, your loan pricing may have to be adjusted to reflect current market conditions. Some loan programs allow for a one-time float down option that can be used during the rate lock period. The one-time float down allows you to seek a lower rate should rates drop while your loan is locked. No one knows if rates will rise or fall, so it's impossible for a home mortgage consultant to tell you whether or not you should lock or float your loan. The decision is yours. If you are looking to build your home, some lenders provide the ability to lock your range of interest pricing for up to one year to accommodate lengthy construction time frames. The first thing you should do is get pre-approved for your VA Loan and obtain a pre-approval letter from your lender. The seller will want to see a letter from your lender stating you are qualified to purchase their home. Having a pre-approval letter from your lender will put you in a much better negotiating position. So that you do not jeopardize your loan approval refrain from making any major purchases like furniture or appliances until after closing. The application is the beginning of the loan process. The lender will submit the application package to an automated underwriting system that will determine the necessary documentation needed for your loan approval. In some cases, the lender may also manually underwrite an application package. The lender's loan processor reviews your credit reports and documentation to verify your employment, debts, and payment histories. If there are unacceptable late payments, collections, judgments, etc., the processor will request a written explanation from you. The processor also reviews the appraisal and survey and checks for property issues that may affect final loan approval. The processor's job is to put together an entire application package for the lender's underwriter. The lender's underwriter is responsible for determining whether the application package prepared by the processor meets all the lender's criteria. If more information is needed, the loan is put into "suspense" and you will be contacted to supply the needed documentation. When the underwriter approves the loan, the lender issues a conditional commitment to lend, orders title insurance, works with you to clear all conditions to its commitment to lend, and then schedules a closing time. The closing will occur after all conditions are cleared and the lender issues a full loan approval. Closings in Virginia are performed by title companies or attorneys who act as your settlement agency. At the closing, the lender "funds" the loan with a cashier's check, draft or wire to the settlement agency, which in turn disburses funds, in exchange for the title transfer to the property to you. At closing you will provided a Closing Disclosure which itemizes all of your settlement expenses. Settlement expenses are broken down into two categories; Loan Costs and Other Costs. Click Here for more information about the Closing Disclosure. The veteran can pay the fee of a VA Appraiser and VA compliance inspectors. The veteran can also pay for a second appraisal if they are requesting a reconsideration of value. The veteran cannot pay for a second appraisal if the lender or seller is requesting a reconsideration of value or if parties other than the veteran or lender request the appraisal. The veteran can pay for recording fees and recording taxes or other charges incident to recordation. The veteran can pay for the credit report obtained by the lender. The veteran can pay that portion of taxes, assessments, and similar items for the current year chargeable to the borrower and the initial deposit for the tax and insurance account. The veteran can pay for the hazard insurance premium. This includes flood insurance, if required. The veteran can pay the actual amount charged for a determination of whether a property is in a special flood hazard area, if made by a third party who guarantees the accuracy of the determination. The veteran can pay a charge for a survey of the property. The veteran may pay a fee for title examination and title insurance. If the lender decides that an environmental protection lien endorsement to a title policy is needed, the cost of the endorsement may be charged to the veteran. Unless exempt from the fee, service members & veterans must pay a funding fee to VA. Veterans who have a 10% or greater service connected disability are exempt. Spouses of veterans who died while on duty or from a disability connected to their service are also exempt. Exempt status will most likely be confirmed on the veteran’s Certificate of Eligibility (COE). Additional fees attributable to local variances may be charged to the veteran only if specifically authorized by VA. The lender may request VA to approve such a fee if it is, (a) normally paid by the borrower in a particular jurisdiction, and (b) considered reasonable and customary in the jurisdiction. Loan closing or settlement fees, document preparation fees, preparing loan papers or conveyance fees, attorneys services other than for title work, photographs, interest rate lock fees, postage and other mailing charges, stationery, telephone calls and other overhead, amortization schedules, pass books and membership or entrance fees, escrow fees or charges, notary fees, preparation and assignment of mortgage to other secondary market purchasers, trustee's fees or charges, loan application or processing fees, fees for preparation of the Loan Estimate, fees charged by loan brokers, finders or other third party fees and buyer representation and real estate broker commissions. For more information about what fees can or cannot be charged in connection with obtaining a VA Loan see Chapter 8 of VA Pamphlet 26-7. During negotiations buyers can ask for seller concessions up to certain limits. A concession is anything of value added to the transaction by the seller, builder or any interested party. A concession may also include any closing costs that would normally be paid by the buyer or cash given to the buyer to lower non-housing debts. Funds received from a relative to assist with a home purchase, or cash contributed from an employer as part of a corporate transfer are not considered seller concessions. The Department of Veterans Affairs is more lenient when it comes to seller contribution limits. Under its home loan guaranty program, a seller is allowed to pay all closing costs, plus up to 4 percent of the sales price to reduce other costs normally paid by the buyer. The 4 percent limit includes but is not limited to the VA funding fee, prepaid tax and insurance expenses, discount points and payment of any debt to help the borrower qualify for the mortgage. Seller-paid concessions can sometimes make the difference between being able to purchase a home or not. You should avoid including furniture, lawn mowers or other expensive items in the purchase agreement. Such gifts generally are viewed as non-allowable seller concessions. As an alternative, negotiate the transfer of those items outside of the purchase contract. When structuring an offer, your REALTOR® can advise you regarding what settlement expenses you may want to ask the sellers to pay. A seller's willingness to pay part or all of your settlement expenses depends upon market conditions and the seller's motivation to sell. If you are purchasing a home in a seller's market and have limited funds available for settlement expenses, you may be able to negotiate an increase in the sales price of home with an agreement the sellers will pay your settlement expenses equal to the amount of the price increase. This can only work if the home will appraise for the higher sales price. If it does, then you haven't paid too much for the property and you have solved your cash flow problem. In a buyer's market your REALTOR® may be able to help you negotiate not only seller paid settlement expenses but also a lower price, upfront repairs and home warranties, etc. into the purchase agreement. Questions about VA Loans may be directed to the U.S. Department of Veteran’s Affairs or your lender.